Exclusive: The Almeria utility man is at Murray Park having arrived from Spain on Monday afternoon. Spanish midfielder Juan Manuel Ortiz is at Murray Park holding talks with Rangers, STV can reveal. The 29-year-old, who is currently contracted to Spanish second tier side UD Almeria, plays mainly on the right of midfield. The versatile player has also featured for his club on the left flank and in both full-back positions. An agreement is already in place between the two clubs for the transfer of the player, with Almeria subsequently giving Ortiz permission to travel to Glasgow. Speaking to STV, Almeria's sporting director Alberto Benito confirmed his player was in talks with Rangers. "I can confirm we have had talks with Glasgow Rangers have reached an agremeent over a fee for Juanma," he said. "He has been with Almeria for four years and he is a very important player. "He can play in several positions. He can play on the left or right hand side of attack, but also defensive left and right. He is also very quick." When asked if he was happy for his player to leave the club, Benito replied: "No we are not happy. But for him, who is a very good person and player, this is a good move. 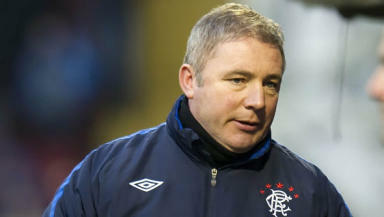 "It is important for him to play at a big club like Glasgow Rangers, who have the chance to play in Champions League. "For me it is a big problem because I now have to find three players to replace him." Ortiz, also known as Juanma, started his career with Atletico Madrid, making five appearances for the club while also spending spells out on loan with Osasuna and Poli Eijdo. A move to Almeria followed in 2007 and he has gone on to play 126 times, scoring nine goals. Almeria were relegated from La Liga at the end of the 2010/11 season, finishing in 20th position. Ortiz was subsequently told the club would not stand in his way if an offer came in, along with a host of other first team players at the club.